I got permission from Alfndrate to write a fresh guide to Malifaux and hopefully it'll help a lot of players that come here to inquire. I'll try to pack as much in here as I can while keeping it as neat as possible. Malifaux is a skirmish game by Wyrd Games. It's set in the Victorian Era (I believe as of the last set of stories, the year is now 1910, so now 9 years after the Victorian Era ended, but oh well). The game is kind of a hodgepodge of themes, ranging from cowboys and Cthulu to demonic children and undead hookers, but somehow, it all fits together wonderfully. Unless you 100% only like massive battle games or are a die hard futuristic sci-fi fan and won't play anything else, give Malifaux a try. You won't regret it. - For starters, Malifaux does not use dice as a mechanic (you can use them to track wounds, but more on that later), but instead uses a standard poker deck with both jokers included. The only difference is that the suits are different, but it is tournament legal to use any poker deck (the suits have a very clear conversion). Hearts are Rams, Clubs are Tomes, Spades are Crows, and Diamonds are Masks. - Additionally, do you like not having to spend $50 on a rulebook every year? Great! 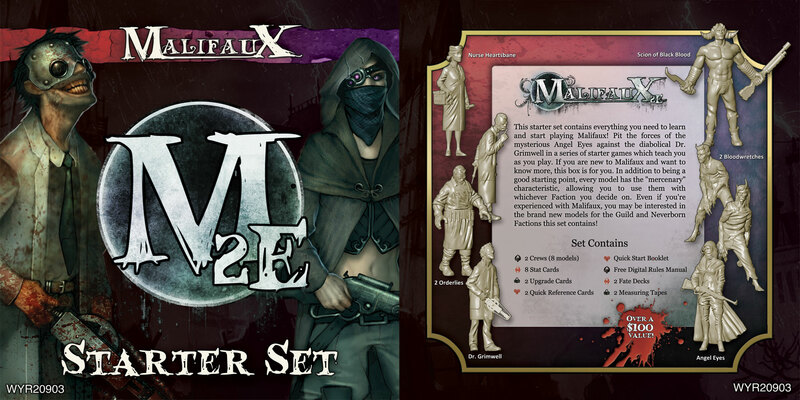 Every box of Malifaux comes with all the rules for what's in the box in the form of a simple stat card! It's incredibly easy to use, has everything you need on it, and if you slip them in a sleeve/laminate them/are just careful with a dry erase marker, you can mark any damage/conditions right on the card! Oh? You bought one of the older metal models? No worries, the standard rulebook has the card for the model! You can also get the card in the appropriate Arsenal Box (more on that later). - Wyrd has very high quality plastic sculpts that get better each month. They use the same production company as Wargames Factory and have become very well known for some of the best plastic miniatures on the market. - Tired of not knowing what's going to be released until it's up for sale? Every Monday, Wyrd posts on their Facebook page and on their forum a preview of a new render/art for a model or something else they're producing at the time. Wyrd's staff consists of about 8 people and all of them are very active in the community and love the game. They're always willing to help people out/show what's coming/talk about problems/take suggestions. - The entry cost/cost to play is much lower than most other games out there. More on this later. - Every 2 months, Wyrd puts out a newsletter called the Wyrd chronicles. It contains new stories about Malifaux, painting guides, terrain guides, upcoming releases, and more. - Wyrd does sales. Mainly for Black Friday and Gencon, but also on Easter occasionally, Wyrd does a massive sale. They put out what new models will be available well in advance and there are limited edition models (usually alternate sculpts of existing models) that you get for free for spending certain amounts of money ($100 and $200 or $150 and $300 depending on the sale, it varies). They also do Miss and Nightmare models, which are gender swapped and more terrifying versions of other models in the game respectively. - The stories are very nice and come out with each Chronicles/new book. Each story is progressive and advances the storyline in game instead of retconning old material. What Exactly is Malifaux (Besides a Game)? This spoiler is full of fluff about the game. Basically, the game Malifaux is set in an alternate reality where Earth used to full of magic, but it was rapidly being depleted. A conclave of sorcerers amassed to find a way to save magic. They called their group The Guild and they managed to open up a rift into another world (killing them all in the process, as there was a massive explosion). This rift (the location is unknown, but it's most commonly though to be in America, near Mississippi due to some of the characters mentioning nearby locations) is called the Breach and it connected Earth to another world, which contained a nearly identical Victorian style city, called Malifaux, that showed no signs of a population, yet was nearly pristine. The big difference was that there were materials here that could be used for magical spells (as well as 2 moons and different constellations, but that doesn't really matter). There were texts in other languages never seen and technology far more advanced than steam power or electricity. Additionally, man soon discovered scrolls containing a new type of magic, one not possible on Earth; necromancy. People flocked to Malifaux to try and make a fortune, but it didn't last long. Within a few years, the Breach ruptured. It began to shrink and people couldn't travel through it. Earthside, people could hear screaming and sounds of battle for days as the Breach gradually shrunk. Finally, a body was thrown through to Earth and the Breach was closed. The body was a shirtless soldier with a word carved into its chest... "OURS." One hundred years passed and Earth fell into a rapidly-losing magic mess. The Guild had become a completely new entity, now a sort of corporation that was a monopoly on magic and magical supplies. What remains of the original Guild has long since distanced itself from this superpower. All of a sudden, the Breach tore back open, in the same location it had originally been. Malifaux once again seemed barren, with many areas now war-torn and ruined, but there were no signs of life. The Guild, in full control over it, decided that they should not allow a massive rush of people in so as to prevent another massacre. Instead, the Guild only sent in soldiers (to set up a defensive area) and prisoners to handle labor. Very soon, a new resource was discovered, the soulstone. Soulstones provided an incredibly potent battery of sorts for magical power. The Guild rapidly set up mines using convicts to collect soulstones in order to strengthen their monopoly on magic. However, Soulstones weren't useless once depleted, they could be recharged. All you have to do to recharge one is have it near somebody when they die. Soulstones then trap the soul so that it can be used for magic. The Guild made good use of this too. Slowly, more threats are beginning to arise and more breaches are connecting Earth and Malifaux. Want more fluff? Read the stories! They're fantastic and they all connect in fantastic ways. 1 Rulebook. You can buy the big rulebook ($40 retail), which contains fluff for all the factions and models, as well as all the rules you'll need to play, or the smaller manual ($15 retail), which just contains the rules to play. 1 Tape Measure. Any will do, Malifaux uses inches. 1 Crew box. Pick one you like the look/playstyle of. There's a lot to choose from and I've done my best to list them below. 1 Opponent and a place to game. Alternatively, Wyrd recently released a start set, which contains 4 models for the Guild Faction and 4 for the Neverborn, as well as a quick-start guide to teach you the game, a free download for the e-book version of the rules, 2 tape measures, and 2 fate decks. It's well worth it if you're starting out. Additionally, all of the models are mercenaries and can be hired into other factions. You may run into other books. These are likely from the last edition of Malifaux ("Malifaux", "Rising Powers", "Twisting Fates", and "Storm of Shadows"). Just look for a logo on the product that says "M2E" and you'll know it's this edition. The two other M2E books are Crossroads and Shifting Loyalties. These are not necessary for starting out. Crossroads contains lots of stories and thematic scenarios, as well as the rules for a second wave of models. Don't worry though, if you're buying Wyrd's plastics, the rules come in the box (though you can photocopy them out of the books too). Shifting loyalties contains more fluff, the rules for a campaign system (if you played Mordheim, you'll feel very comfortable with this system), as well as a third wave of new, unreleased models. The Guild is the corporation that is trying to run Malifaux and monopolize soulstones/magic. The Guild is led by the Governor General, who has a compound based within the Guild controlled portion of Malifaux. This is the headquarters for all Guild offices, including the Neverborn Hunters, the Death Marshals, the Witch Hunters, the Anti-Amalgamation Front, and more. They also have some awesome looking steampunk constructs. The Guild is characterized by jack of all trades models, lots of shooting, durability, and lots of people wearing dusters. They're a great faction for new players. The Arcanists are a sort of liberation group. They run soulstone smuggling operations right under the Guild's nose and have a firm anti-Guild policy, believing that magic should be a free and widely available resource. Additionally, the leader of the Arcanists, Victor Ramos, is also the leader of the Miners and Steamfitters Union, which controls all non-prisoner based labor in Malifaux as well as the operation of the railroads. This prevents the Guild from taking out Ramos, as it would cause open revolt from the unionized workers. Most of the Arcanist masters are heavy spell casters (except Ironsides) and they cover a variety of themes, from beasts and ice to constructs and fire. Look here if you like playing the mage class. The Ressurectionists are those devoted to the study of ressurecting the dead. It is a self-taught practice derived from scraps of long-abandoned texts found in the Quarantine zone, where enthusiasts will build secret bases protected by swarms of undead. Major players of this group include Nicodem, the manager of all graveyards/funeral services in Malifaux as well as Dr. Douglas Mcmourning, the Guild's coroner. The Ressurectionist masters excel at playing the game of attrition. This faction has the most summoning and Resserectionist players tend not to care if you're killing their minions, as they'll summon them back while they go handle other things. Many models in this faction are very survivable, but lack ranged attacks. Look here for summoning, zombies, staying power, and of course, zombie hookers. The original residents of Malifaux. Nobody knows where they came from or why they waited to reveal them selves, but the Neverborn are angry and here to stay. There are several competing factions within the Neverborn, but they all have an uneasy alliance against humanity/other powers. These factions include the brutal Nephilim that represent nature within Malifaux, the woes, which are the emotions of Malifaux, the Mimics, which can take human form and manipulate others, and the Swampfiends, which are the beastly reptilians and such. Neverborn masters are often characterized by their speed and status as glass cannons. They can be very powerful, but cannot take hits back. Look here if you like speed or making your opponent beat themselves up. Originally, the Outcasts were the faction where masters were thrown that didn't fit another theme. Now, they're much more synergetic, but still represent those that work outside the confines of the other factions. Many Outcast models are mercenaries, which means that they can be hired by the other factions for a slightly higher cost. These are the people that chose not to sign up as Guild soldiers, but instead to make it on their own, forming warbands of hired guns/swords or those that serve darker powers. The Outcasts feature a diverse range of themes, from the general purpose Freikorps to the melee-centric Viktorias, both of which are great for new players. There are also the more complex masters, such as Hamelin, Leveticus, Tara, and Jack Daw, which will be discussed below. Earthside, the Ten Thunders are a massive crime syndicate that dominates the underworld of the Three Kingdoms (unified Asian countries). First, the Oyabun (leader of the Thunders), sent his daughter and lieutenant, Misaki, through the Breach to gather information and make alliances. More breaches have opened up in the world and one opened well within the Oyabun's control. The Ten Thunders have used this personal Breach to send more forces into Malifaux in order to infiltrate the other factions until the day comes that they revolt and seize Malifaux for themselves. 6 of the Ten Thunders masters are dual faction, meaning they can be run as Ten Thunders or another faction as each of those 6 has infiltrated another group within Malifaux. This is a very diverse faction that can run unique combinations of models that would be impossible in other factions. Look here if you like ninjas, drugs, or asian-styled models. South of Malifaux, there is a large Bayou that is home to giant mosquitos, swamp beasts, and most importantly, pigs and Gremlins. Before humans showed up, Gremlins and Pigs kept each others' population in check by devouring the other party, but Gremlins are quick learners and able to parody other factions. First, the Gremlins learned to domesticate pigs of every size, causing their population to skyrocket. Then, they learned how to wear clothes, which the humans though was quite funny. After that, they learned how to use/make their own guns and very quickly learned how to raid. Only then did humans learn that they had made a very bad problem for themselves, which is only kept in check by in-faction rivalry between Gremlin parties. The Gremlins are a goofy faction, but that doesn't make them weak. Gremlins become more powerful by damaging themselves, but also have easy access to healing, which negates the downsides, making them very scary. Look here for good laugh, powerful synergies, the frequent detonation of your own guys, bacon, and giant constructs made of whiskey barrels that can induce drunkenness in game. Lady Justice is blind, but don't let that fool you. She is hands down the most brutal melee master in the game, with a 3/4/6 melee attack with wonderful triggers, the ability to hit back if you fail a melee attack against her, the ability to support her crew whenever she dives in to attack, and a solid heal. If she touches it, it's going to die, but don't leave her unsupported as those 14 wounds will disappear quickly. She's a fantastic melee master and as the head of the anti-necromancy Death Marshals, she is very good against undead models and prevents corpse/scrap markers from being dropped. She works very well with her thematic crew (The Judge and Death Marshals), but can be run with just about anything. What to buy: Start with her box, The Guild's Judgement which contains Lady Justice, the Scales of Justice (her totem), the Judge, and 3 Death Marshals. After that, pick up an Exorcist (her thematic enforcer) if you want to really punish those Ressurs. Sonnia Criid is the leader of the anti-Arcanist portion of the Guild, the Witch Hunters. With her friend Sammael Hopkins (possibly the most loyal man in Malifaux) by her side, the two round up rogue magic users, which is all a front for Sonnia to acquire new tomes of spells for her own use. Those captured magicians? They're thrown into cells and degraded into the shrivelled and clocked Witchling Stalkers, which are then set loose on the Arcanists.Sonnia is one of the three fire themed masters in Malifaux, specializing in blowing everything up. Due to her Visions of Flame ability, any enemy model with the burning condition (which is handed out by basically everything in her crew), can be seen by Sonnia and Sam, even without Line of Sight. This means that Sonnia can drop her destructive flame blasts on enemies hiding behind terrain. Sonnia is almost entirely a damage based master, but she can also summon. With her Reincarnation upgrade, if an enemy model within 8 inches and line of sight to her dies with the burning condition, she can discard 2 cards or soulstones to summon a Witchling Stalker. This makes Sonnia one of the most reliable summoners in the game and allows her to snowball into a more powerful force, but her crew is very fragile. Sonnia and Sam lack any inherent defenses beyond using soulstones. If something gets to them, they will die. What to buy: Start with her box, The Torch and Blade, which contains Sonnia Criid, Sammael Hopkins, the Purifying Flame (her totem), and 3 Witchling Stalkers. After that, pick up her thematic enforcer, the Witchling Handler (an absolutely amazing model that makes all friendly models nearby apply burning from their attacks). From there, Sonnnia might like a bodyguard (A Guardian or Francisco Ortega work quite nicely). Perdita Ortega is the leader of the Latigo Posse after her father went insane. With her family, the Ortegas, she is considered the best Neverborn hunter in Malifaux. Her family lives in a compound on the outskirts of the city near the bayou. They are the best gunslingers in game and boast a ton of synergy with each other. When Perdita shoots, you want to be well out of sight and range. However, once you start taking down some of the family members, they will quickly run out of activations and lose steam, but even then, they are a force to be reckoned with. What to buy: Start with her box, The Latigo Posse, which contains Perdita, Francisco, the Enslaved Nephilim (her totem), Santiago, Nino, and Papa Loco. All of these are very good models and Francisco is often considered one of the best models in the Guild. From there, you'll probably want to grab the matriarch of the family, Abuela Ortega, who is a fierce shot and some Latigo Pistoleros, which are cheap/solid bodies to boost your numbers. Lucius Mattheson is the Governor General's secretary. Very few have seen behind his mask and nobody seems to know what he's planning with his fellow Neverborn. He is nowhere near as killy as the ladies of the Guild. Instead, Lucius excels at turning weaker models/minions into terrors by buffing them and giving them extra actions. Due to this, he is more difficult to play than other masters, but not impossible. Lucius excels and scheme marker based objectives, but not at killing. His box comes with himself, the Scribe (his totem), Captain Dashel, 2 Guild Lawyers, and 2 Guild Guard. From there, Guild Riflemen work incredibly well with Dashel, as he increases their damage and reliability. Any model with the Guardsman characteristic works very well with Lucius/Dashel. Additionally, Lucius can hire Mimic models from out of faction. These are the Doppleganger, Beckoners, Mr. Tannen, Mr. Graves, and Candy, all of which are solid models. C. Hoffman is one of the construct masters in the game. He works almost exclusively with them. He plays by handing friendly constructs upgrades (-1 ap to interract, add rams to your duel totals, nimble, and such), giving them more attacks (an obey), copying their attacks, and power loop. Power Loop is a condition that lasts until Hoffman activates again. Every model that it's power looped gets to share Ca, Sh, Ml, Df, and Wp (you keep your attached suits though and don't gain any new ones). Hoffman gets 1 free power loop every turn and can cast it more. His totem also is always looped. This is incredibly powerful in some situations and leads to Hoffman clumping up (often called the Hoffball). He can also hire any Arcanist M&SU construct (mainly Metal Gamin, which give everyone a Ca of 8, making Hoffman's spells a near-guarantee), the Rail Golem, Howard Langston, Joss, and Steam Arachnid Swarms. His box contains C. Hoffman, the Mechanical Attendant (his totem), a Guardian, 2 Hunters, and a Watcher. A Peacekeeper is a fantastic addition. A second Watcher is great as well for a scheme runner. His brother, Ryle is a brutal addition as well (Use Hoffman to give him nimble, then let him run around on his own). He has a solid heal for any construct, a free push, a fantastic gun, and an even better melee attack. Dr. Douglas McMourning is the Guild's Coroner, Ressurectionist, and on Lucius's payroll for private services. He excels at schemes running, poison, and being a near-unkillable melee beast when he wants. His upgrade "On the Clock" allows him to hire Sebastian, Nurses, and the Zombie Chihuaha, all of which are solid models. Nurses can apply very harmful conditions to enemies, as well as fully heal your own models or just hand out massive amounts of poision. Sebastian makes enemies take poision damage when they activate as well if within 8 inches of him and if the enemy is within 6 inches as well, they'll take 3 damage per poision. He's got a solid melee attack as well. He can also make models near him Undead (great for the Judge and Exorcist) and hand out precise to melee models, making them more brutal by ignoring defensive abilities. His box contains McMourning, Sebastian, the Zombie Chihuaha (his totem), 2 Nurses, a Flesh Conststruct, and Canine Remains (the last two can never be used in the Guild but are essential to his play as a Resser). From there, definitely get a Witchling Stalker for condition removal (Nurses can heal a model completely, but paralyze them. Stalkers remove the paralyzed condition. It's a match made in heaven) and an Exorcist. The models from the Malifaux Starter box (Dr. Grimwell, Nurse Heartsbane, and 2 Orderlies) also work very well with McMourning and fit in thematically. Lucas McCabe isn't called Indiana Jones for legal reasons, but he is a blast to play. He revolves around possessing "artifacts" as upgrades that he can give to different models. On him, each one has a specific effect (a healing flip, the ability to reactivate models, and more melee damage), but on other models those same upgrade grant regeneration, nimble, and an amazing melee attack instead. Additionally, he's the only mounted master in Malifaux. When you kill him, you've actually just killed the horse and he'll dismount and lose his mobility. He works very well with a big beater or two that he can push up the board, but he can also make minions into absolute terrors. His box contains both McCabe models (mounted and on foot), Sidir (an all around amazing henchman), Luna (his totem and trusty sidekick), and 3 Wastrels. From there, pick up a model you want to shoot up the board and some Guild Hounds (Luna makes them even better). The Guild Austringer is incredibly powerful. Using his Raptor, he can attack into combat without randomizing and do decent damage or force your opponent to discard 2 cards, which is incredibly powerful. His Deliver Orders action is fantastic as it pushes a model and then drops a scheme marker. Use this to push a friendly model out of combat/harms way or get them where you need a scheme marker. At 6 stones, this guy is a steal. The Guild Pathfinder is a nuisance for your enemy. Every turn, he can summon or relocate a clockwork trap, which can give ever enemy within 2 inches slow when they activate, make disengaging strikes, and do damage whenever an enemy ends a walk within its engagement. The Pathfinder has From the Shadows, which let's it be deployed anywhere so long as it's at least 6 inches away from your deployment zone. Put him in a nice spot (usually on the center line), summon some traps to screw up your opponent, and use his rifle to drop blasts on the enemy. Another 6 stone model that is fantastic. Witchling Stalkers can remove conditions, hand out burning, and run schemes. I never run a crew without at least one because condition removal is so huge. Remember, when removing something like Poison or Burning, you don't remove one of the number, you remove it all. An all around solid minion. If you're going to buy them though, just buy Sonnia's box. It's worth it for the extra models (and more cost effective). Watchers make incredibly good scheme runners. At 4ss, you can usually fit in a pair of them. Just fly them where your opponent isn't and drop scheme markers. A Peacekeeper is a solid, reliable model that can tank damage, drag things towards it, then beat them down in melee. Plus it's a big robot and what's not to love about that? Executioners are slow melee models that are absolutely disgusting once they get into melee. They're especially good with Lucius or with the Judge, as both of those models can pull them forwards more quickly. Viktor Ramos is the leader of the Arcanists as well as the labor unions of Malifaux (making him the biggest thorn in the Guild's side). He's a mad scientist, politician, and obsessed with spiders. His big beater? Half spider cyborg who was "saved" after a cave in. His minions? Spiders that can swarm together or detonate. His totem? Giant spider (which does not fit on its base well). Ramos is a summoning/support master. Once per turn, he can summon 1 to 3 Steam Arachnids off of a scrap marker and through an upgrade, he can summon Electrical Creations. He buffs nearby constructs and he has upgrades to heal them as well when they activate. The rest of his crew however, is incredibly nasty to face. Steam Archnids are a pain to kill, Swarms can gobble up scheme markers and ruin enemy plans, Joss can make scrap markers, is absolutely brutal in combat, and is very survivable, and Howard Langston is a fast melee monster. Oh, and if a construct is stuck in with a bunch of enemies but can't do much, Ramos can just blow it up to deal damage! Be careful though, there are some models that can make Ramos blow himself up too, though it is very rare. What to buy? Start with his box, the M&SU. After that, definitely pick up another box of Steam Arachnids. If you can magnetize them to make swarms, great! If not, I'd recommend 6 spiders and 1 Swarm to start. You can be very clever with their modelling/basing and stretch it more (put 2 on a Swarm base, or model them coming out of pipes/sewer grates and only need half a spider to do it!). An Electric Creation is a great buy as well because Ramos can summon them and when they die, they explode and drop scrap. A very common first turn (because Ramos is incredibly slow) is to activate an Electric Creation, walk it forwards twice (it takes damage for each action), then Activate Ramos, use his 0 action (Magnetism) to push just outside of the Creation's explosion range (the Magnetism action will kill it), then summon 2 spiders off of the scrap marker! Mei Feng is a champion of the people. She has worked her way up in the Ten Thunders as a commander and in the Arcanist, as the leader of all the Rail Workers. As a master of magic related to fire and steel, she created Metal Gamin, the secret Rail Golem, and the mechanical limbs she gives her workers after they are injured (they can choose loyalty to her and a free limb or debt to the Guild forever). She has her men working all day for the Rail Union and all night for the Ten Thunders, digging secret tunnels all through Malifaux. When the time is right, she hopes to kill Ramos, the Governor General, and the Oyabun herself (as the last once openly mocked and beat her out of jealousy for her magic). In game, Mei works best when in a cluster of enemies. She can push them around and follow through with a Jackhammer Kick, protect her own crew by creating cover with Vent Steam, and maul anybody with her Tiger's Claws. Once she gets into combat, expect a chain of attacks with plenty of triggers. Don't expect to come out alive from her. But she's slow, right? Nope. Mei has a very unique ability called Rail Walk. For a 7 of any suit, Mei can be placed in base contact with a friendly construct or scrap marker within 6 inches. On the built in trigger, she can do it again, as many times as you've got the cards to do. She is one of the few masters that can get across the board in one turn. She is the only master that can do it with just 1 AP. Mei also has some ties with the Burning condition. She can hand it out, Railworkers can do bonus damage because of it, and the Rail Golem relies on it to get bonus attacks. What to buy? Start with her box, the Rail Crew. This gets you Mei Feng, her tanky sidekick Kang (who gives out bonuses against undead and constructs), the Emberling (her totem, but it can drop scheme and scrap markers! ), and 3 Rail Workers. From there, consider getting Metal Gamin and a Rail Golem, both of which work thematically for her. Willie the Demolitionist is another fun (highly explosive) model that she can hire regardless of being an Arcanist or Ten Thunders master at the time. Be on the look out for Sparks and the Mechanical Porkchop too. They will have rules in the new Shifting Loyalties book and can be hired by Mei. Sparks is a Henchman that can buff constructs. The Mechanical Porkchop is a construct version of a Warpig, basically. Anasalea Kaeris started as a punctual woman obsessed with order. Due to her time with Ramos, she has begun to harness her magic, which she finally was able to do with the realization that the order she sought was an illusion. Since then, she's been able to hurl fireballs and use her mechanical wings to cause plenty of hurt. She's also the only character that can pick you up and drop you from a height to cause damage. Kaeris is all about the Burning Condition (A 3 way game with Sonnia, Mei Feng, and Kaeris is incredibly interesting! One ignores terrain when Burning is out, one does bonus damage when Burning is out, and one piles it on and gets speed boosts when Burning is out). Models near her that are friendly and have Burning gain the flight ability, effectively ignoring terrain, Gunslingers can put out bonus damage on models with Burning, and Kaeris can summong Fire Gamin off of models that die with Burning. If you like fire, this is the master for you (if you haven't gathered that from the last few sentences). What to buy? Start with her box (the old metal one contains Kaeris, 3 Fire Gamin, and 2 Gunslingers, but the new one will have Kaeris, The Firestarter (her Henchman who does more burning), the Eternal Flame (her totem, which removes immunity to burning), and 3 Fire Gamin). From there, grab Gunslingers if you don't have them (they should be out in plastic soon). Kaeris also plays very well with a Rail Golem (they are immune to burning damage, but can use burning to generate mroe attacks) and can make it fly. Toni Ironsides is the Troubleshooter for the M&SU. She was shunned for her skin color back on Earth and earned her wages in underground fights where she dominated. Now, she's come to Malifaux to work for Ramos. When a group of workers won't join the Union or wants change, Ironsides is sent in to "troubleshoot" the issues (Read: She beats them until they accept Ramos's terms). Ironsides has her own condition, Adrenaline, which is pretty simple. If she activates near enemy models, she builds up adrenaline. She then uses it to hit harder and heal at the end of the turn. Please note, she is not a straight-up melee beater. If you put her up against Lady J or the Viktorias, she will die quickly. Ironsides is all about picking the perfect fight to tie the enemy up in and if you can't find one, make one. Ironsides hands out amazing buffs to nearby M&SU models that make them hit harder and last longer. She can run a very effective elite crew. What to buy? Start with her box, the Troubleshooters, which contains Toni Ironsides, The Captain (Her henchman who packs a punch and can push models around the board), Mouse (her totem, who can drag models into an area and lock them down for Toni to hit), and 3 Oxfordian Mages (amazing spellcasters who do a lot of damage and buff Toni/The Captain). From there, consider Ramos's box, as Joss and Howard work very well with Toni, Johan (an amazing M&SU mercenary), or Mei Feng's box (Rail Workers excel with Ironsides as well as Mei). Colette DuBois runs the Star Theatre. Her showgirls are an elite group of the most desired women in Malifaux. She also runs the best smuggling operations in Malifaux, using the ancient sewers beneath her theatre and has a squadron of living (and deadly) mannequins, some of which kill you with the power of ballet (and knives). She is one of the hardest masters to attack, as she can teleport away and perform death-defying stunts. Her abilities in direct combat are very poor, but she dominates the game at placing scheme markers and is capable of letting showgirls drop them as a 0 action and placing them anywhere on the board even if you're nowhere near where you need them to be. Look here if you like showgirls, murderous mannequins, and a very tricky crew. Be warned, she is not very good for beginners. What to buy? Start with her box, Smoke and Mirrors, which contains Colette, Cassandra (a melee henchman who can copy Colette's spells), 3 Mechanical Doves (cheap totems that Colette can summon. They fly very quickly, can act as scheme markers, and can sacrifice themselves to buff models), 2 Performers (minions that lure models in and lock them down), and 2 Mannequins (Peons that help with scheme markers and can sacrifice themselves for the showgirls). From there, consider a box of Coryphee (expensive mannequins that can merge to form a single model, the Coryphee Duet, which is one of the killiest models in the game), Angelica (Colette's master of ceremonies who can lock down an area of the board, available by November 2015), and/or another beater, such as Howard Langston or Joss from Ramos's box. Rasputina is the snow queen of Malifaux. Her playstyle is all about ice and explosions. Her ability Ice Mirror allows her to cast her spells through her other models at a slight penalty, which makes up for her incredibly slow speed. There is no master in the game better at slowing down enemy models. If you need speed though, it is available through her Henchman, Snowstorm, who can pull any one of Raspy's thematic models into base contact with him. What to buy? Raspy works really well with her thematic models. Start with her box, December's Curse, which comes with Rasputina, Wendigo (her melee totem), 3 Ice Gamin (cheap, but sturdy minions), and an Ice Golem (a sturdy model that packs a punch). From there, look into December Acolytes (incredibly effective ranged models that slow down the enemy), SnowStorm (her melee henchman), Silent Ones (powerful models capable of healing and dishing out ranged damage), Blessed of December (an excellent melee model), and possibly the new Ice Dancer (a thematic model that can handle scheme running and glides around the board as she builds up momentum). Marcus is the Beastmaster of Malifaux. He's a support master who can buff nearby Beasts and even make models (including enemies) into Beasts. His signature ability is Alpha, which allows him to give a Beast a free activation under his control, which means if you can turn the enemy's master of beater into a beast, you can turn them against their own crew. Additionally, he can hire Beasts from any faction into his crews, meaning he can be prepared for almost any scenario. What to buy? Start with his box, which contains Marcus, the Jackelope (his totem, which can pop out of any dead beast), Myranda (his henchman, who can heal beasts and turn into any Arcanist beast she wants), a Sabertooth Cerberous (a Three headed murder machine), a Razorpine Rattle (a fairly efficient and fast snake), and Cojo (a beater/area control piece). From there, definitely look into Molemen for your scheme runners and possibly Waldgeists to lock down an area. Dr. Douglas McMourning is the posion master of Malifaux. When played as a Guild master, he can dish out a lot of poision and do schemes. When played as a Ressur, he's one of the most brutal masters in the game. Basically, McMourning stacks up the poison condition through his abilities/his crew very quickly (deal 1 damage at the end of the turn and remove one stack), his crew can increase the damage per tick of poison, and some models in his crew heal whenever they would have taken poison damage. If McMourning can kill a model in his activation (through his Expunge spell), you get a free, Flesh Construct (an incredibly cheap and tanky model). If they just die from the poison condition near McMourning, you get a Canine Remains for free instead. This allows him to snowball very quickly once some poison gets out. His crew is also surprisingly fast, with pushes and through his Nurses giving models bonuses to their walks. What to buy? Start with Body of Evidence, his crew box, which contains McMourning, Sebastian, 2 Nurses, a Flesh Construct, a Canine Remains, and the Zombie Chihuahua (McMourning's first ressurection). From there, definitely consider getting another Flesh Construct (or 2) and a box of Canine Remains. Guild Autopsies are also amazing with McMourning (and fluffy). Nicodem the Undertaker is the most diverse summoner in Malifaux. He can turn corpse markers (dropped by living models when they die, but also can be dug up by Canine Remains and Mortimer) into any undead Ressurectionist minion if you've got a high enough card. He tends to sit at the back of his crew and buff/summon whatever needs to get the job done. Models near him get bonuses to attacks, defenses, and are immune to the slow condition (which is given when summoned). I'm going to say right now: I do not advise you get into Malifaux with Nicodem. You will likely want a very diverse set of models, which is most of the Ressurectionist faction. Most of the models Nico likes to someone can be found in the crew boxes of the other Ressurectionist masters though. However, if you do want to start here, get his box (Open Graves), a box of Mindless Zombies, and then a box of Necropunks (or Molly's box for Crooligans), as the are amazing scheme runners. After that, get whatever you think looks cool/useful. The Maniacal Laugh upgrade is a staple with this master as well, giving him a 0 AP action, which turns all nearby corpse markers into Mindless Zombies, which still function as corpse markers, allowing for extra activations and better positioning. If you pick up the general upgrades deck or the Ressurectionists Wave 2 deck, make sure you've got the Spare Parts upgrade, it's a staple in this faction and is just great on most masters. Appreciate the work, very helpful! Something I'd add to the first section is a brief system/rules overview, comparing/contrasting it to wmh, infinity or 40k etc. Something I'd add to the first section is a brief system/rules overview, comparing/contrasting it to wmh, infinity orn40k etc. It's all coming, I was in the hospital for awhile and haven't had the time to finish it, but this weekend should change that. Cool, I'd never even looked at Malifaux (since I assumed there was no way anyone here played it), until the other day when I noticed that there's actually a henchman and a club etc not toooo far away. In the what makes Malifaux special section, I would add a note about how the FAQ gets updated every other month (alternating with Chronicles) based on questions that have popped up on the forum. All kidding aside, I really need to get around to grabbing a second crew and getting to painting so I can bring Malifaux to the group for consideration now that we've all pretty much lost hope in GW. Sorry for the delay everyone. It's done through the Arcanist masters section. Very informative, look forward to the rest - thanks for your continued efforts! Very nice, thanks for all the hard work so far I'm picking up my "Hired Swords" box today, so I'm having fun reading some Malifaux lore to get into it. I kind of forgot about this, but the comments are some good motivation to work on this more this week. Thanks guys! Short and strong description of Masters. I'm totally happy that you already covered both factions I'm interested in. Keep going!